Are you feeling signs of aging? Imagine waking up feeling better than you have in years with lots of energy, good health, and a new zest for life. That's exactly the way thousands of men and women feel after taking Vital Factors, a revolutionary anti-aging formula to help fight aging and promote healthy longevity. Human Growth Hormone (HGH) is a natural life sustaining protein produced by the pituitary gland in your brain. It keeps your cells young and vibrant. As you age, your body secretes less HGH, which contributes to a change in your body shape. You may see a loss of muscle tone, weight gain, reduced immunity, loss of vigor, stamina and energy. For decades men and women who could afford to spend thousands each month, have taken HGH injections. They do it because their lean muscle mass is improved along with their energy, memory and focus, vigor and youthful appearance. After years of university research, scientists have found that certain natural protein derivatives (called secretagogues) can help coax the body into releasing its own stores of HGH. 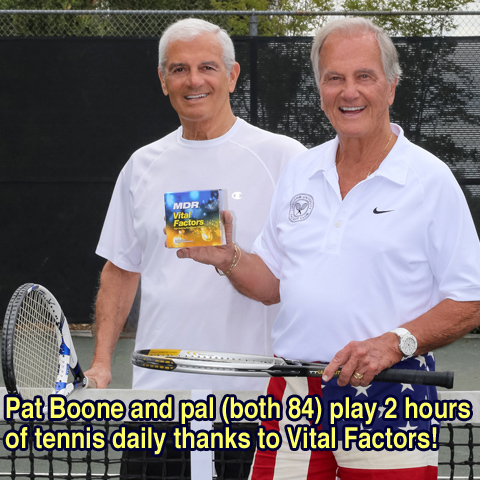 Vital Factors contains a proprietary complex of these natural Growth Hormone Releasers. Combined, these miracles of nature help support age-defying processes in the body, helping you to feel like a new person full of energy and youthful vitality! Known as S.O.D, this is the Superman of antioxidants, protecting our cells from "oxidative aging", the same process that turns iron to rust. Unfortunately as we age, our natural S.O.D. levels decrease. Race horses have lots of aches and pains, but after they were given S.O.D., the horses seemed happier, in a better mood, and able to perform better. Scientists tested the horses' muscle cells and discovered better oxygen uptake, and less oxidative stress after a strenuous run – meaning less inflammation! The horses really did feel better! Inflammation is called the Silent Killer because it is linked to so many maladies that come with aging. As we get older, toxic cell compounds accumulate and inflammation increases. Have you noticed the signs of inflammation… achy joints, sore knees or fading short term memory? Inflammation wreaks havoc on your mind and body. Men and women reported waking up refreshed, less irritable, and having more energy. Has your muscle tone decreased? As your metabolism slows and you have less energy to work out, if you keep consuming the same amount of calories, over time, weight gain becomes a problem. Scientists call it creeping obesity. To keep your youthful shape, you need to eat right and exercise. Vital Factors gives you the vitality to work out again. Plus the S.O.D. complex was shown in an animal study to help prevent obesity and reduce abdominal fat. The only proven way to extend lifespan is by calorie restriction. Eating less triggers a gene called SIRTUIN that Harvard scientists found slows aging. Convinced that some natural compound might activate the same gene, scientists tested thousands of compounds until they found an ingredient in red wine (Resveratrol) that ACTIVATES the same LONGEVITY GENE! Scientists always suspected red wine had health benefits. Tests confirmed Resveratrol reverses signs of aging. The miracle molecule helps mice live longer. It increases their endurance, limits weight gain, and protects the heart, joints, skin and neurons of the brain. It also increases production of energy. When mice, who ate an unhealthy high fat diet, were given Resveratrol, they gained less weight, ran like athletes on the treadmill, developed muscles, appeared younger, and lived 20% longer! Many supplement companies get Resveratrol from an inexpensive Asian herbal source, Japanese Knotweed. The FDA has issued a statement concerned about the safety of long term use of this herb. In contrast, with Vital Factors you benefit from the purest source of Resveratrol in the world – Resvida™ Whole Grape Complex. It is responsible for the natural deep color and delicious flavor of the Vital Factors formula. With MDR you can feel confident that you are getting the finest ingredients to help you live healthier longer! As we age, or if we take Statins, Co-Q10 levels decrease. Without sufficient levels, you slow down. Vital Factors reenergizes you with Co-Q10, a vital enzyme required by cells to produce energy, especially for the heart. With aging, levels of Vitamin B-12 also decline, which can cause anemia and fatigue. B-12 is vital to memory, brain function and protein synthesis and you get it when you take Vital Factors. A Healthy Heart Means a Healthy, Long Life! The walls of our blood vessels stiffen as we age. Vital Factors contains Arginine, shown to be beneficial for blood flow and cardiovascular health. In a 10-year study with over 2,000 healthy adults, lower levels of bicarbonate was linked to an increased risk for premature death by 24 percent. Scientists theorized sodium bicarbonate assists your body in balancing pH levels, possibly extending life. Taking Vital Factors and eating a diet rich in fruits and vegetables helps support a healthy alkaline pH. Get Muscle Support with Vital Factors. With aging we tend to lose muscle and strength. Vital Factors supplies Aminopeptides that help support muscle synthesis, wound healing and immunity. Like many body builders have discovered, if you exercise after taking Vital Factors, you'll see results: muscle gains, loss of fat, improved metabolism, and the ability to stay in shape easier. As we age, our immune system declines and that is one reason we are prone to more health problems. Keeping our immune system strong is important. Vital Factors contains a seaweed derived molecule, called Fucoidan. University studies prove that Fucoidan helps strengthen immune defenses so you stay healthy. It also helps bind to foreign toxins acting as a detoxifier. Many of us take probiotics for gut health, but did you know that there are no guarantees that the good bacteria in yogurt, for example, can survive the acids in your body. Fucoidan, contained in Vital Factors, was recently found to modulate gut micriobiota by acting as a prebiotic agent! That means it helps the body to maintain a more balanced composition of beneficial bacteria such as Lactobacillus and Ruminococcaceae. That means better health and immune defenses to protect you! Some researchers believe long lived people on the island of Okinawa owe their extreme health and longevity to their diet rich in fucoidan-based seaweed. Scientists have found Fucoidan can help improve the bioactivity of stem cells, the rejuvenating factors that repair cells throughout our body so we stay healthy and youthful. Age-Defying Seed Lives over 1200 years! Ancient Egyptians, and Buddhist monks in India and China revered the Lotus Flower as a symbol of longevity. UCLA scientists obtained 1288 year-old seeds and planted them. After 4 days, the ancient seeds sprouted like young seedlings! Scientists found the seeds contain a powerful MT protein enzyme, vital to repairing DNA damage that allows the seeds to withstand the effects of aging, and helps promote healthy brain function. Just like the Lotus reawakened after 1200 years, Vital Factors can help reawaken youthful physical and mental energy you thought you lost years ago! Order today and enjoy greater vitality, peak physical and mental performance, and a healthy long life! OFFER SUBJECT TO CHANGE. Call 1 800 637-8227 for current offer. Every since Ive started taking Vital Factors, my muscles feel strong & my energy has gone up. I have a very stressful job and taking the Vital Factors seems to have helped control those stress levels. Im 74 and feel AMAZING after taking this! Been taking it for 3 years . GREAT product. One of my FAVORITE products you make, hands down! Love the way these make me feel! Every since I started taking these a year go, my skin, hair, and nails feel look and feel so much healthier! Ive never been so happy with a product in my life. It has helped my health so much and I feel amazing. Thanks for making this! Telling everyone about it! I have never done a review before but I have to let it be known, I have been taking this product for ten years now and have to say I have not been sick ever since not kidding! Over the years I have been around a lot of sick people, have not had not even s sore throat or sniffles, My friends and family are always amazed that I dont get sick. Some people think these are pricey but I tell them its a lot cheaper than the doctor bills I could have had!! I am fifty nine years old and I feel great everyday! I will not ever stop taking these!!!!!! I was miserable with continual alternating between feeling too cold and too hot. After months of this, I tried Vital Factors and have been comfortable since. I take Vital Factors because it makes me feel better! No one believes I am 75 years old. My wife and I work long hours. After taking Vital Factors we feel a day and night difference in the way we feel.